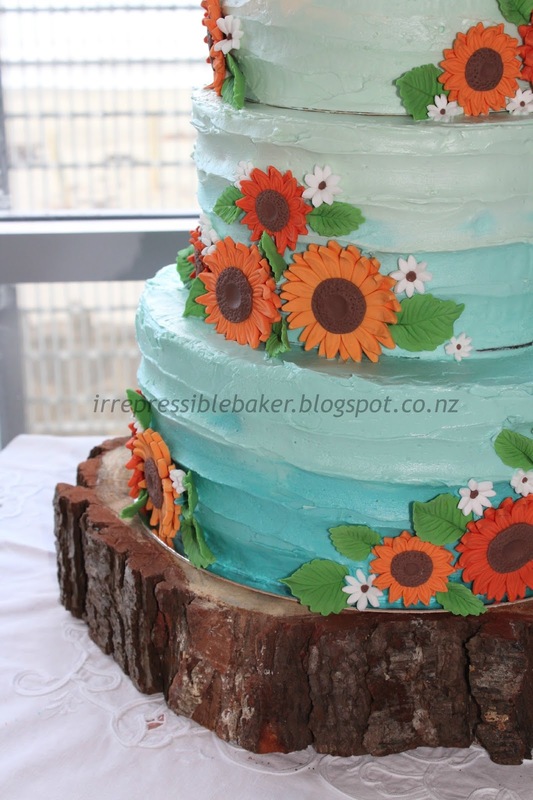 This wedding cake was for my (very trusting!) friend C and her fiancé who were married at Easter weekend. Their stunning inspiration photo was this one below. Unfortunately I don’t have the credit details at hand – it seems to originate on OneWed but they don’t list the source… I’ve asked the site moderators for the credit info and will update if I get a response. Goes to show how important it can be to watermark your work! I’ve used PicMonkey to mark the photos that follow, on the recommendation from the wise and wonderful Rose of Rose Bakes. She provides some super-simple instructions that helped me a lot here. 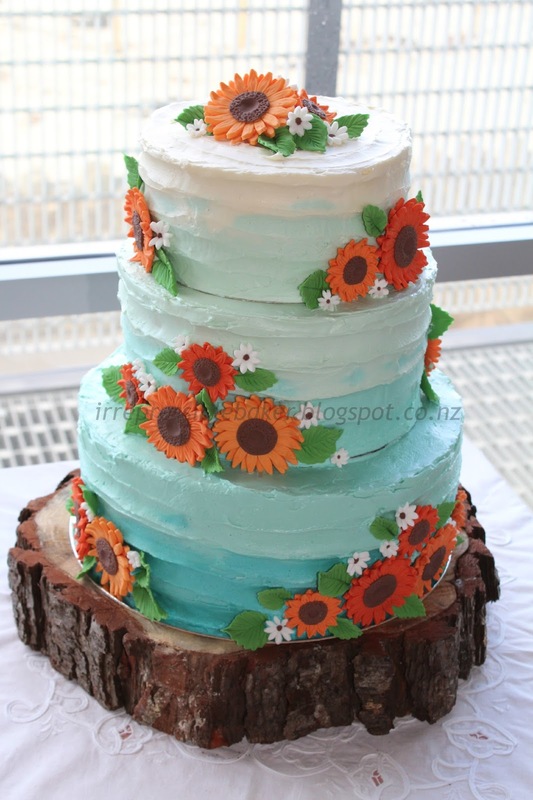 Also, she makes gorgeous and clever cakes that you should definitely check out! 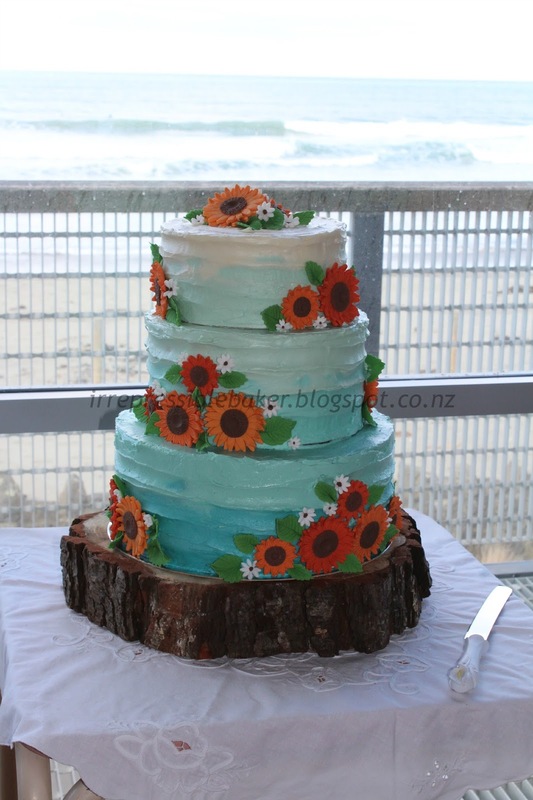 I must add that the bride’s talented friend M created the stunning sugar sunflowers and foliage, travelled hours with them by car and attached them just before the reception – legendary work!!! 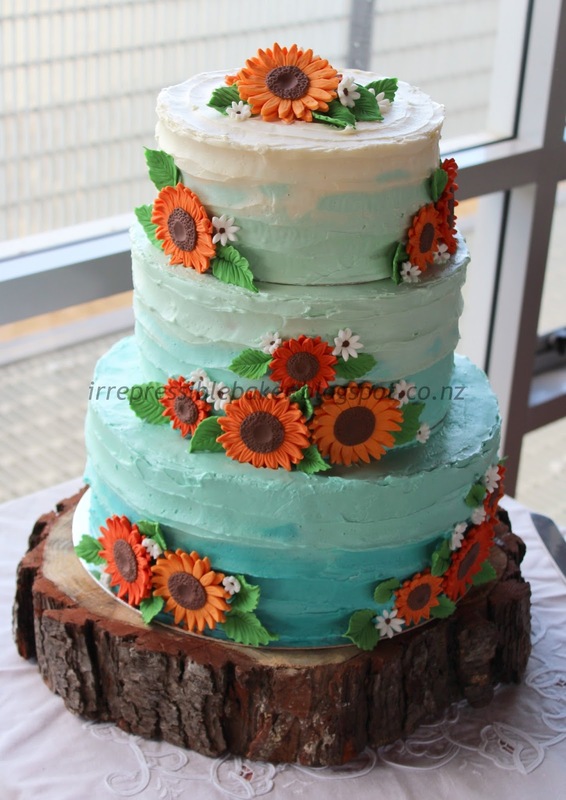 Despite neither her nor I knowing what the other was going to do, I think that both cake and decorations looked beautiful together. This cake had to serve approx. 120 guests so a single-tier like the one above wasn’t going to cut it. 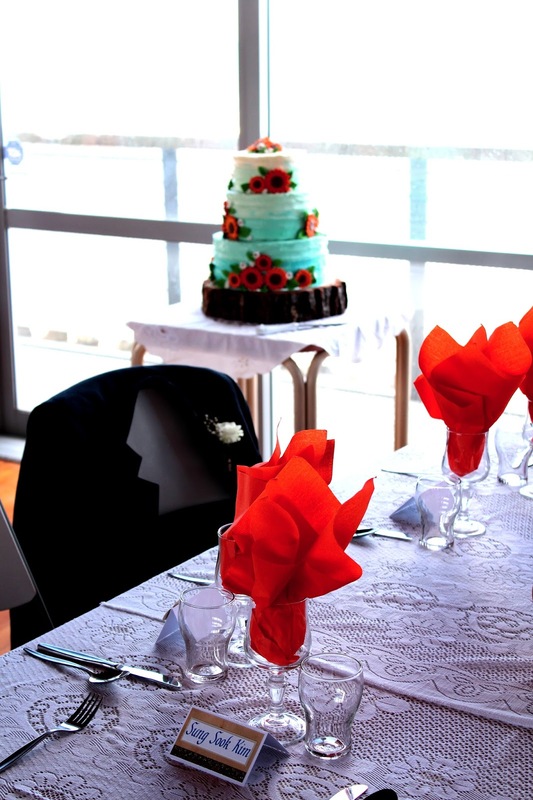 In fact, it took a 12 inch carrot cake, a 10 inch passionfruit buttermilk cake and an 8 inch rich chocolate mud cake, as well a sheet cake also in the mud cake flavour to provide enough dessert for the guests. 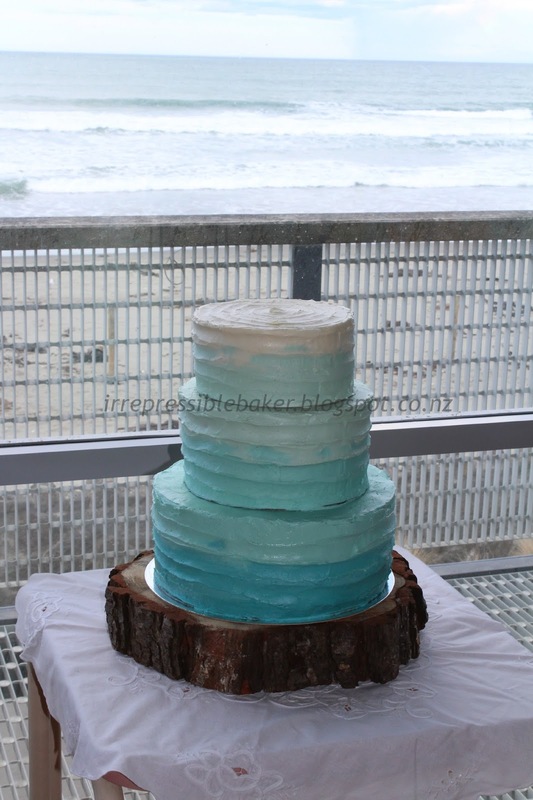 Not as delicate as the inspo cake, but with the sunset-over-the-ocean theme of the wedding, I tried to create an ombré effect of waves with foamy tops. In the first picture below you can compare it to the real waves and decide for yourself how I did! Super shiny Swiss meringue buttercream! 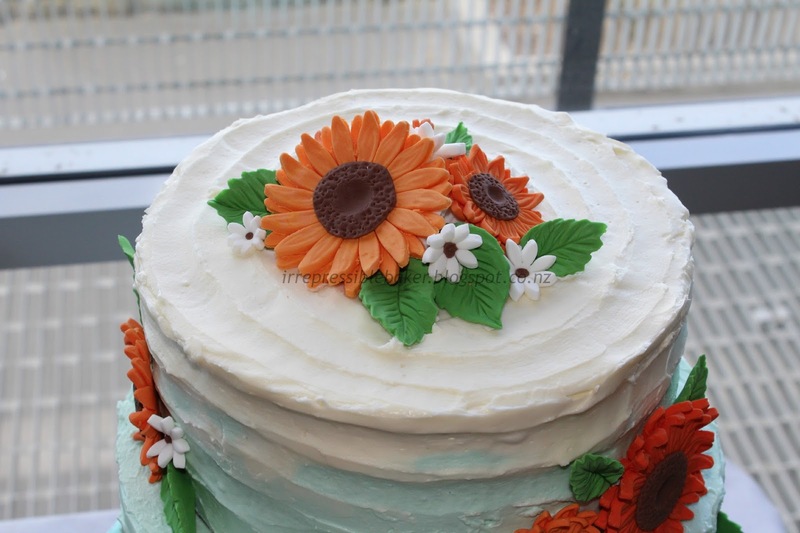 From another angle, the icing pattern looks more frothy and its colour looks better blended (something that I realised I need more practice at!). Now I’m just playing with my new camera for lighting fun! Yes, I played around with the contrast in this pic and I don’t regret it at all!! 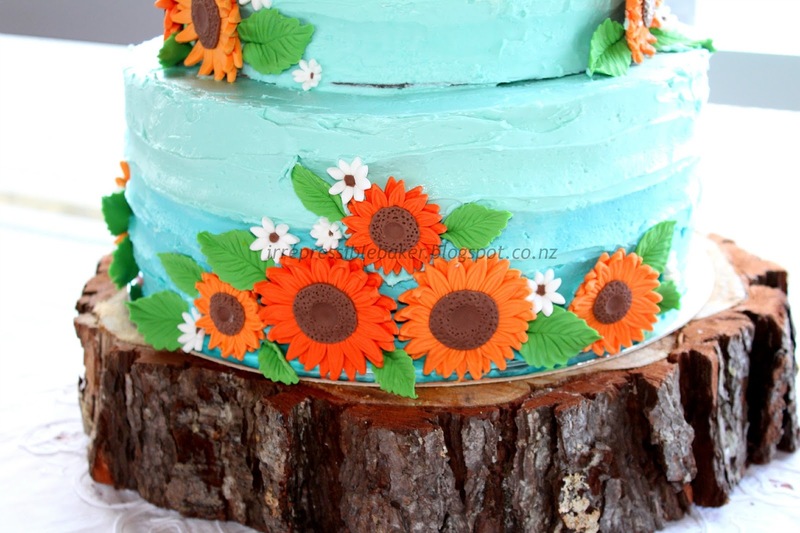 I love the lighting in this picture – and the detail in those sunflowers! I used the Chelsea Sugar carrot cake recipe, but as is this is prone to under-cooking in my very average oven, I’ve since switched to an Annabel Langbein recipe. For the filling, I used my favourite recipe for super-stable cream cheese icing from Rose Bakes with a little lemon rind added. The passionfruit buttermilk cake is a Women’s Weekly recipe that I have recently come across – very dense but with a nice fresh flavour from the passionfruit. It was filled with a store-bought passionfruit curd (us working gals have to take shortcuts somewhere!) but unfortunately the layers were prone to sliding as a result, since the curd reduced friction between them. 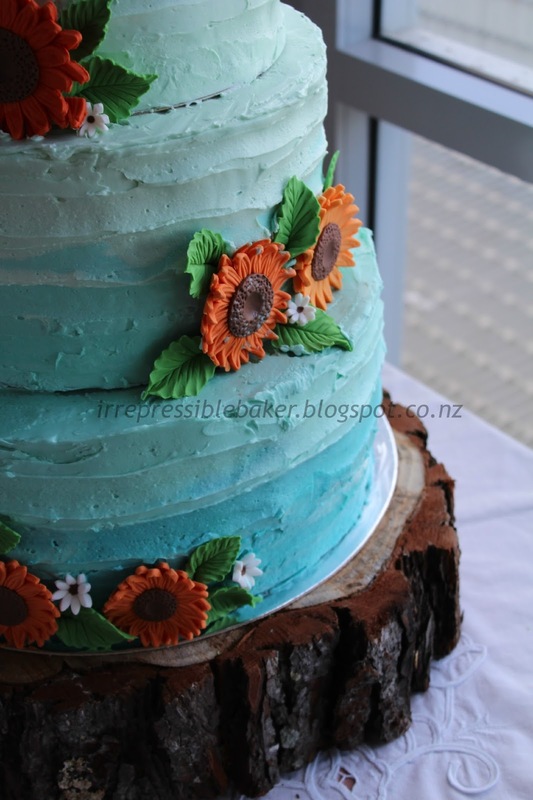 Next time I’d recommend a passionfruit buttercream instead. For the chocolate cakes I used another Chelsea recipe – it still produces a spongy chocolate cake texture rather than a thick brownie-like one. Which is totally fine if you want rich chocolate flavour which still looks like cake! 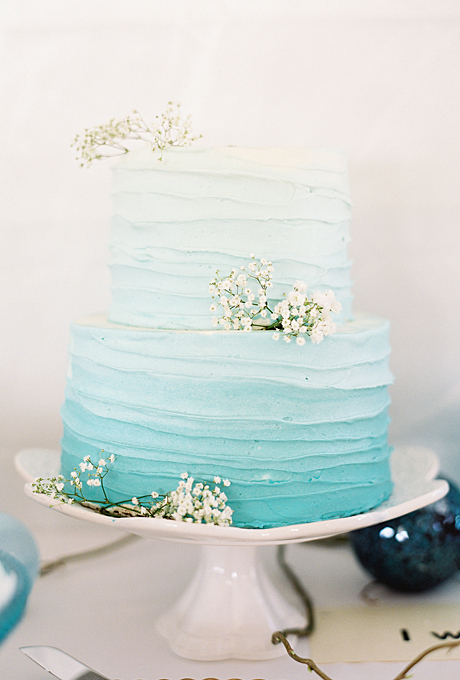 Simple white chocolate ganache filled these chocolate layers. The Swiss meringue buttercream was made the cheat’s way that has changed my life (which one day I will add to my SMBC post…) in copious quantities – 4.9 times the recipe at that link to be precise! 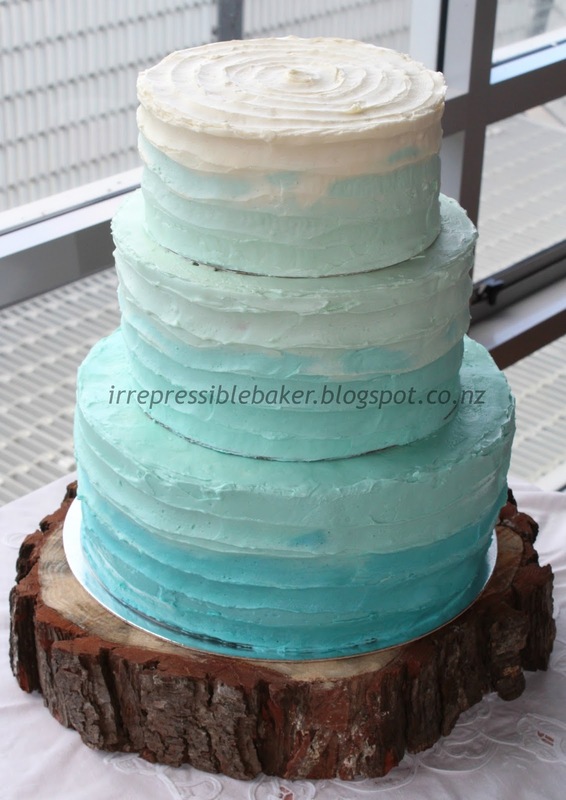 After crumb-coating the cakes, I coloured the rest of the icing four separate shades of blue, which took more Wilton Sky Blue gel colour than you would imagine given the pastel shade. And I used two shades on each layer, obviously the lighter on the top half and the darker on the bottom. I was washing blue colouring off everything in sight for days! Note: 12 inch cakes are heavy and need to be firmly attached to their base board – this one wasn’t and went for a little slide into the side of its carry box in the car on the way. 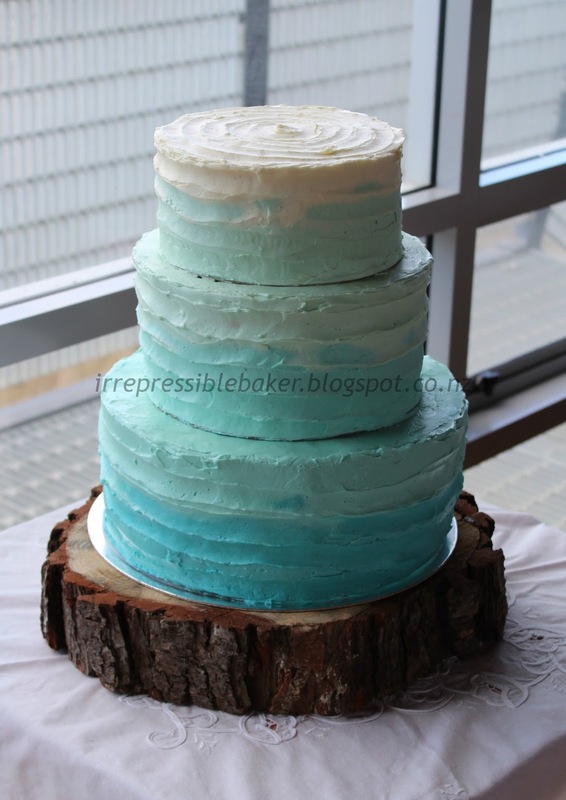 Fortunately buttercream is very forgiving and fixable! !